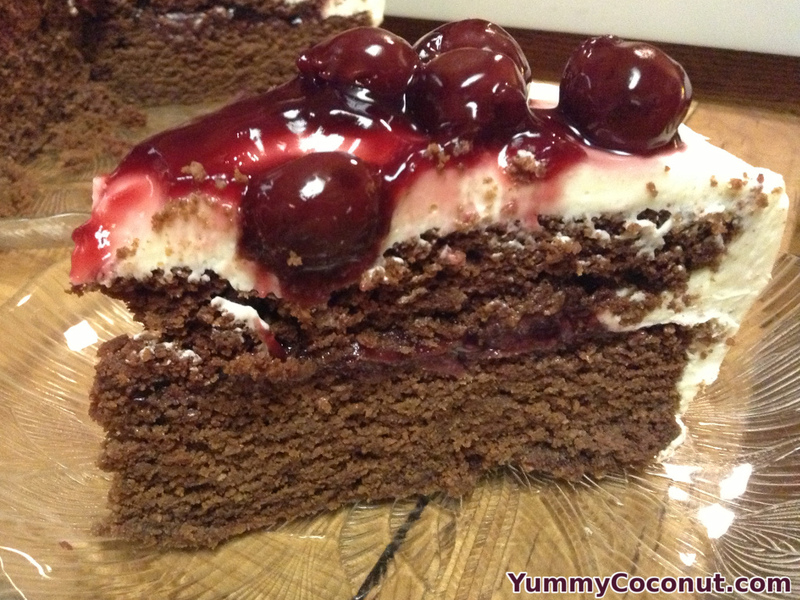 This chocolate cake is perfect for birthdays or anytime you want a delicious cake. With the eggs and coconut flour, this cake is not just a treat for your taste buds, it’s also a treat for your body! Grease two 9 inch cake rounds and set aside. In a bowl, stir together the sugar, salt, coconut flour, cocoa powder, baking soda and baking powder. Make sure it is well combined. In another bowl, mix together the rest of the ingredients. Once combined, add to the dry ingredients and stir until no clumps are present. Place half of the batter in one cake pan and the other half of the batter in the other pan. Bake approximately 30 minutes or until the middle of the cake is set. Prepare the frosting and filling while the cakes are cooling. To make the frosting, cream together the cream cheese and butter until they are combined. Slowly mix in the powdered sugar until you like the sweetness of the frosting. For the cherry filling/topping, heat the cherries and sugar (if using), in a saucepan until they begin to bubble. Mix together the cornstarch and the water. Pour it into the cherries and mix together. Let cook for about 3 minutes until the mixture has thickened. Remove from the heat and let cool. 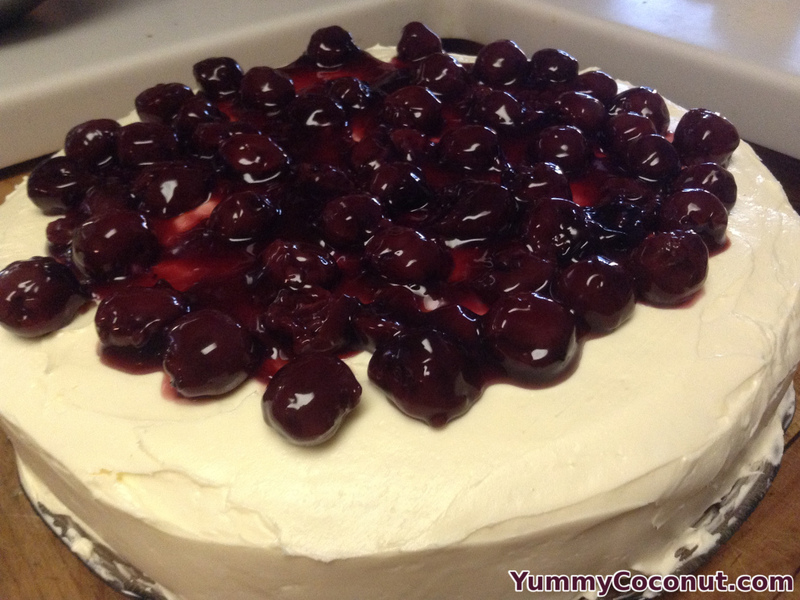 You can either put half the cherry mixture in between the two layers of the cake and the other half on top of the frosted cake, or place all the cherry mixture on top. Chill for a couple of hours in the refrigerator and serve. Smooth the tops of your cakes before you place them in the oven. This batter does not tend to setter because it is so thick, so the way your cake tops look when you place it in the oven is the way they will look after it has baked. You could use blueberries or strawberries instead of cherries here if you prefer. Only use the optional sugar if your berries need a little extra sweetness.